In a benevolent royal gesture, His Majesty King Hamad bin Isa Al Khalifa yesterday commissioned HM the King’s Representative of Charity Works and Youth Affairs, Supreme Council for Youth and Sports Chairman and Bahrain Olympic Committee President HH Shaikh Nasser bin Hamad Al Khalifa, to visit a young Bahraini fisherman who was recently seen in a series of videos uploaded online while selling fish in a spontaneous and heart-touching manner. His sporty behaviour got thousands of likes on social media. 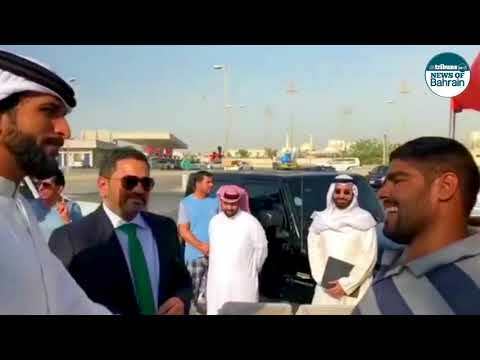 HH Shaikh Nasser paid a surprise visit to Hamad Town yesterday where hardworking Mohammed Falamarzi sells fish everyday on the pavement corner near the petrol pump, close to Roundabout 2. “I am here only to convey HM the King’s greetings,” HH Shaikh Nasser told Falamrzi and his brother Jassim yesterday. HH Shaikh Nasser reassured him that “his issues with the CR will be solved soon”. Escorted by officials of the Royal Charity Organisation and representatives of Bahrain’s leading wholesalers, HH Shaikh Nasser informed Falamarzi that arrangements are being made to sell his fish at hypermarkets, mentioning Lulu Hypermarket, in a helping and supporting gesture to the young man. HH Shaikh Nasser promised the fisherman and his brother to gift them a new boat to expand their work, as an appreciation of their devotion and hard work. “We will also want you to have a restaurant and next year we want to eat at it,” HH Shaikh Nasser added.